Monterey Museum of Art presents, Armin Hansen: The Artful Voyage, organized by the Pasadena Museum of California Art and curated by Scott A. Shields, Ph.D., Associate Director and Chief Curator at the Crocker Art Museum in Sacramento. This exhibition is the largest and most comprehensive survey of Hansen’s work, over 60 works of art including paintings on view for the first time. Armin Hansen: The Artful Voyage traveled from the Pasadena Museum of California Art and the Crocker Art Museum, culminating at the Monterey Museum of Art for its final destination. 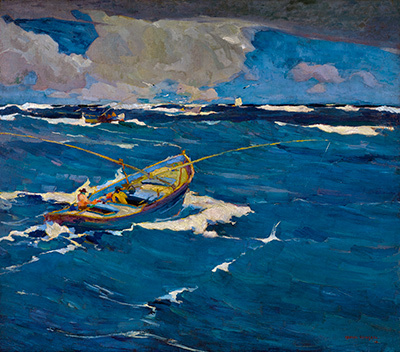 Armin Hansen is one of the Monterey Peninsula’s iconic painters who is celebrated for his bold and expressive depictions of heroic men and the sea. Hansen captured the raw power and vitality of the Pacific Ocean and those who sailed it. His style and artistic leadership created a legacy of California landscape painting that influenced many modernists who came thereafter to study with him in Monterey. While his style is often described as impressionist, Hansen was more emphatically influenced by German Expressionism during his studies with Carlos Grethe (1864–1913) in Stuttgart. He explored a vibrant palette and rugged brush strokes to evoke humanity’s relationship with nature. His blustery scenes of the sea communicate broadly the impact of hardship and physical labor and the importance of bravery in the face of elemental challenges. He was one of the earliest members of the Carmel Art Association, founded in 1927. He was also a founding member of the Monterey History and Art Association. By the 1920s he was among the most respected California painters and was deeply involved with the artistic life of the Monterey region.